The San Juan Marriott Resort & Stellaris Casino will open its doors to the general public, who will be able to use the pool and other amenities. The 527-room San Juan Marriott Resort & Stellaris Casino is one of the Condado area’s most iconic and long-standing hotel properties. 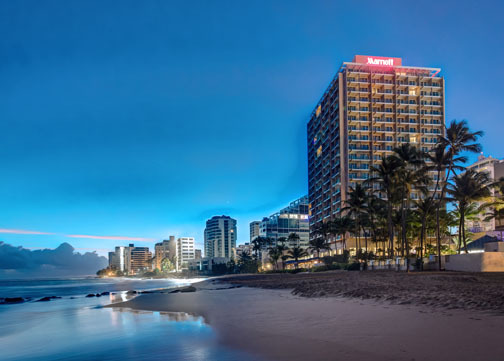 The San Juan Marriott Resort and Stellaris Casino in Condado has reportedly been sold to unnamed Chinese investors, for some $184 million, according to real estate site The Real Deal. On Sunday, the site cited sources saying the sprawling 527-room beachfront property sold for more than $350,000 per key. Chicago-based Jones Lang LaSalle Inc. — known as JLL — helped arrange the deal between the new owners and sellers Rockwood Capital and Interlink Group. JLL Senior Vice President Andrew Dickey and Managing Director Gregory Rumpel headed the transaction, the site reported. “The San Juan lodging market has performed well over the past few years, despite short-term impacts in 2016 in the Caribbean region and Puerto Rico’s debt pressures,” Dickey said in a prepared statement that the site quoted. “This property garnered interest from both international and domestic investors due to its beachfront location, outstanding financial performance and affiliation with a globally recognized brand,” the executive told the site. The iconic property was recently remodeled, to the tune of $15 million that was completed in 2015. The revamping included all rooms and suites, two restaurants, its casino, meeting rooms and pool area, as this media outlet reported. The San Juan Marriott Resort & Stellaris Casino boasts more than 14,283 square-feet of space for events spread across 13 rooms and the American International Grand Ballroom, all of which have been redone with new neutral-toned carpets, better illumination, partitions and wall colors. Last year, the property unveiled its renovated vice-presidential and junior suites, which at a cost of $500,000 feature contemporary designs and spectacular views of San Juan and the Atlantic Ocean. The hotel’s occupancy rate has averaged 87.6 percent over the last five years, The Real Deal reported. Hey Buddy!, I found this information for you: "Report: SJ Marriott hotel sold to unnamed Chinese buyer". Here is the website link: https://newsismybusiness.com/marriott-unnamed-chinese/. Thank you.